Schedule Your Next Party at the Blackfoot Art Center! The BAC offers children's and teen's "ARTY" Birthday Parties, just-for-fun Guided Painting Parties for all ages. Arty parties include a theme-related craft project or a guided painting. Private painting parties, which can be booked for all ages, include a guided canvas painting, refreshments, and optional (non-alcoholic) beverages. Book a "Paint 'n Sip" party for adults (21+) if your group would like to bring wine or similar beverages (no beer or hard alcohol, please). Now you can enjoy painting classes and events right here in Blackfoot! Painting events are held regularly throughout the month, and you will be able to book your own private painting party or painting class as well. BAC guided painting classes and events are posted on our Calendar and subject samples are posted on this page. If you would like to book a seat for a painting event, click "Reserve Seat" below or click "Contact Us" to get your name on the list for that event. IMPORTANT: If using this option, be sure to get your payment to us (cash or check) at least two days prior to the event to hold your seat. If you LOVE one of our scheduled paintings, but not the day and/or time, contact us to book a private painting event. Just click the Contact Us tab and let us know when you would like to have your party. You can also call the BAC at 208-252-7126 to get your party scheduled. As an option, take a look at our Gallery to select a painting for your own private lesson or painting party OR you can suggest a new subject and we will prepare a new painting just for you (please give us at least two weeks advance notice). The current Painting Class Event Calendar is shown below. Check back often for new paintings and Calendar updates. No painting class events are planned at this time. Please check back soon! 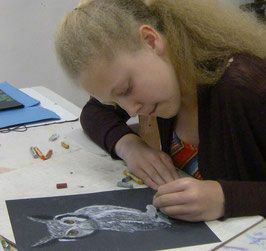 If you would like to support fine arts education by making a donation to the Blackfoot ART Center, please scroll down to the bottom of this page. We appreciate all donations, large and small! As a non-profit, 501(c)(3) organization, the Blackfoot ART Center appreciates your donations, large and small. Donations help us replenish art supplies, keep our class fees low, and serve more students. Thank you for your support of visual arts education in the Blackfoot community!